An escalating U.S.-China trade war that’s sparked tariffs on pork and, potentially, soybeans. Trade negotiations with Canada and Mexico that exploded last week following U.S. tariffs on steel imports. EPA ethanol waivers for oil refiners that undermine demand for ethanol and corn. “Low Prices, Trade Disputes Sow Fear,” by Donnelle Eller. The Des Moines Register (June 5, 2018). 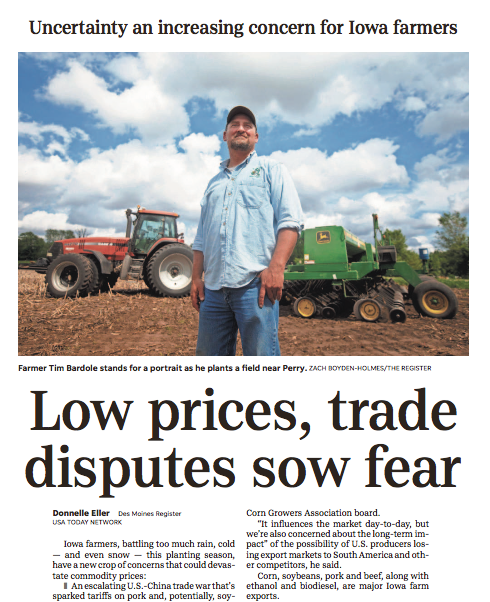 ‘One day, it’s NAFTA negotiations … The next, it’s what Scott Pruitt at EPA is doing on ethanol waivers or trade negotiations with China,’ said [Mark Recker, a northeast Iowa farmer, and] president of the Iowa Corn Growers Association board. Tuesday’s article pointed out, “Bardole said he understands the Trump administration’s desire to get better trade deals with China, Mexico and Canada. But he struggles with the EPA’s decision to grant waivers to refiners that must blend ethanol and biodiesel into the nation’s fuel supply.
. @realDonaldTrump has said he “looovves the farmers!” #Iowa is feeling that love today, as the President just assured me he “won’t sign a deal that’s bad for farmers!” Thank you, Mr. President! Perhaps adding to farmer uncertainty on NAFTA, Bloomberg writers Terrence Dopp, Josh Wingrove, and Jenny Leonard reported on Tuesday that, “President Donald Trump is seriously considering separate trade negotiations with Canada and Mexico but he doesn’t plan to withdraw from the North American Free Trade Agreement, White House economic adviser Larry Kudlow said. U.S. allies are criticizing the Trump administration over its latest round of tariffs ahead of the G7 summit. Farmers are among the hardest hit because of the tariffs so far. @connellmcshane is at a soybean farm in Ogden, IA with reaction. Separately on Tuesday, Reuters writers David Alire Garcia and Miguel Gutierrez reported that, “Mexico put tariffs on American products ranging from steel to pork and bourbon on Tuesday, retaliating against import duties on metals imposed by President Donald Trump and taking aim at Republican strongholds ahead of U.S. congressional elections in November. “Mexico’s response further raises trade tensions between the two countries and adds a new complication to efforts to renegotiate the NAFTA trade deal between Canada, the United States and Mexico. American pork producers, for whom Mexico is the largest export market, were dismayed by the move. Also with respect to trade, Lingling Wei and Bob Davis reported on Tuesday at The Wall Street Journal Online that, “China offered to purchase nearly $70 billion of U.S. farm, manufacturing and energy products if the Trump administration abandons threatened tariffs, according to people briefed on the latest negotiations with American trade officials. The Journal writers explained, “Throughout the negotiations, Mr. Liu made clear to Mr. Ross that the offer would be void if Washington proceeds with its plan to impose tariffs on $50 billion of China-made products, the people briefed on the talks said. “U.S. Farmers Face Broadening Trade Threats,” by Jacob Bunge, Heather Haddon and Benjamin Parkin. The Wall Street Journal Online (June 6, 2018). Still, the uncertainty over trade talks is affecting business decisions in the Farm Belt and could linger even if the current tariff threats recede. Beyond the policy concerns of the executive and legislative branches, Heather Long reported on the front page of the Business section in Sunday’s Washington Post that, “Shane Merrill lives in a small town in South Dakota that’s 1,400 miles from Wall Street, but he watches the numbers as avidly as the traders. “Merrill isn’t an investment manager. He’s a family farmer. Right now, as he drives a tractor and planter to get soybeans in the ground, he’s also checking financial news on his smartphone. He’s worried, he says, about interest rates shooting up. The Post article stated, “His local bank currently charges him 5.75 percent interest on the loan, a bit higher than the national average on a home mortgage. But his rate is almost certainly going to rise, an extra expense as farmers are getting the lowest prices in years for their crops.